Join Us in Looking Back at 2013: A Year of Limited Time Magic! Each week throughout 2013, Limited Time Magic surprised and delighted Guests of all ages in the most fanciful and unexpected of ways at both Walt Disney World Resort in Florida and the Disneyland Resort in California. From all of us with Limited Time Magic, thanks for taking part in every single unforgettable experience—including imaginative entertainment and exciting seasonal offerings like True Love Week, the Monstrous 24-Hour Event and the Friday the 13th Unleash the Villains Party! Calling all Disney fans: you voted and we listened! 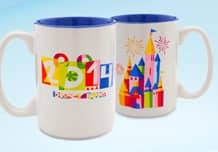 In celebration of the final Limited Time Magic surprise of the year, be the first to purchase all-new art merchandise for 2014 when it debuts at Walt Disney World Resort. Decorated by a design you helped select at the start of 2013, you can find this new art adorning a range of keepsakes, including a mug, T-shirt, ladies tee, timepiece and D-Tech iPhone case. So stop by World of Disney Store in the Downtown Disney area and take home your very own lasting piece of Limited Time Magic! Plus, starting December 27, 2013, you can also discover limited amounts of this new merchandise available for purchase online, including a special, online-only deluxe print signed by artist Patty Landing. Calling all Disney fans: you voted and we listened! 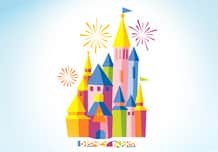 In celebration of the final Limited Time Magic surprise of the year, be the first to purchase all-new art merchandise for 2014 when it debuts at the Disneyland Resort. Decorated by a design you helped select at the start of 2013, you can find this new art adorning an assortment of keepsakes, including a mug, T-shirt, ladies tee, timepiece and D-Tech iPhone case. So stop by World of Disney Store in Downtown Disney District and take home your very own lasting piece of Limited Time Magic! Plus, starting December 27, 2013, you can also discover limited amounts of this new merchandise available for purchase online, including a special, online-only deluxe print signed by artist Patty Landing. Offerings and experiences are subject to change without notice.